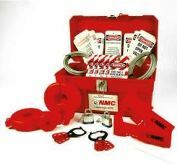 Lockout Kits consist of portable cases that can be easily moved from place to place in a facility. The kits are larger than pouches. They are often used by small crews of employees that work on equipment in different areas of a facility. Lockout kits offer the portability for employees to easily move around in a facility with the locks, tags and other items to keep equipment secure. They come in durable carrying cases. Keep your workplace safe from mechanical and electrical energy.